"For millions of years, an ancient conversation has continued between the chorus of the ocean and the silence of the stone." My guide is Peter Curtin, brewmaster, billy goat hiker, founder of the Burren Tolkien Society, and owner of the Roadside Tavern in the nearby village of Lisdoonvarna. He is helping me with my mission to visit the various habitats of the Burren, a 220-square-mile rolling limestone massif on Ireland's west coast. Today we're going to the top of bare-bones Turlough Hill, where we'll search for traces of the people who lived here 4,000 years ago. Under a pale mist, we navigate yawning rock fractures, fields of scree, and stone walls that have stood without mortar for 1,000 years. 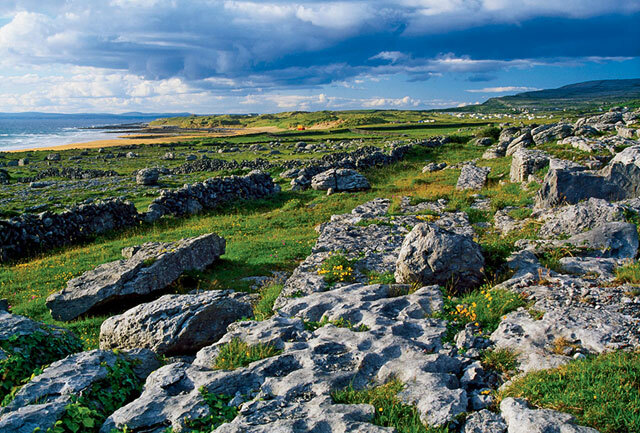 The Burren is one of Europe's largest karst, or continuous limestone, regions. The limestone, which formed undersea 320 million years ago, is laced with fissures through which rainwater seeps, to collect in vast tunnel systems. Ferns, mosses, and wildflowers dwell in the cracks. In places, the limestone has eroded to a calcium-rich soil that nourishes meadows bursting with tiny flowers and thick grasses and more than 700 other plant species. Hundreds of generations of farmers have grazed livestock on the meadows. The Irish government now recognizes local farmers as "Keepers of the Burren" and pays them to preserve the habitat.